Dan Brown’s latest book Inferno is looming large on the publishing calendar and, as someone who disliked The Da Vinci Code and gave up halfway through on The Lost Symbol, this does not fill me with joy. 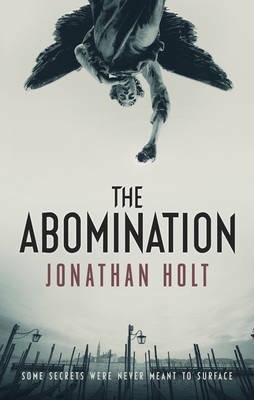 So I was slightly nervous when I received a copy of Jonathan Holt’s The Abomination, billed by many as ‘better than Dan Brown’. Admittedly that in itself is not hard, but categorizing the books together filled me with a degree of trepidation. Over the years many a copy-cat book have flooded the bookshelves in Brown’s footsteps trying to be the next big thing and many have failed miserably. So I’m happy to report that The Abomination is far better than Brown’s works in many, many ways. I’ve always been a fan of the big concept page-turner and this one succeeded on many fronts. Not wanting to spoil too much, it begins with controversial issues such as the ordination of female priests within the Catholic church through to our use of social media websites and cyber-crimes. It ends looking at a much bigger, somewhat nastier picture, with the wars that tore through Yugoslavia and its lasting effects. Overall it’s a conspiracy and a plot device that feels not only well researched but also believable. Our protagonist is Kat Tapo who, on only her first murder case, begins to investigate the body found wearing the robes of the priest and draws around her a varied cast of characters. Two in particular, Holly, a female US soldier newly returning to Italy, and Daniele, a recluse hacker and founder of Carnivia, an online replica of Venice, assist her as the story unravels. Kat also becomes involved in an extramarital affair with her boss which, admittedly at first felt a tad superficial, but by the end fitted in perfectly with the themes of the book. I found Kat to be a refreshing change within this genre. Her interactions with the other characters, in particular Holly, felt honest and real. Holt has created some convincing characters and masters something that Brown fails at – to avoid the ‘info-dump’ where information is revealed to the reader in an Austin Powers style Basil Exposition manner of long passages of description or dialogue. As a destination, I’ve never been to Italy but everything described felt detailed and masterfully drawn. It paints what I assume to be a very accurate portrayal of Venice and the unfortunate menace that lurks beneath her waters. The Mafia, prostitution, drug rings and the desperate need to survive are all exposed by the ebbing tides. Despite this, the place itself, the food and the culture all made me long to be there. It is by no means perfect and I did take a short break from reading for a few days when the story took a small dip in pace but once I picked the book back up, it shifted a gear and I tore through the book’s last 150 pages with speed. A few of the twists and turns took me by surprise and it concludes in a place I wasn’t expecting. The Abomination is billed as the first part of the ‘Carnivia’ trilogy and, while I’m not sure what lies ahead in parts two and three, I’ll certainly be looking forward to the next installment. The Abomination is out now.